I’ve been inspired by all manner of canned fish lately. I have just gotten to know sardines, for instance. This was a can of Sockeye Salmon – Red Salmon, the can said, that I splurged on. It was definitely a deeper red color and more flavorful than the less expensive canned salmon. This can was about $8, but we got two delicious and healthy meals out of it. 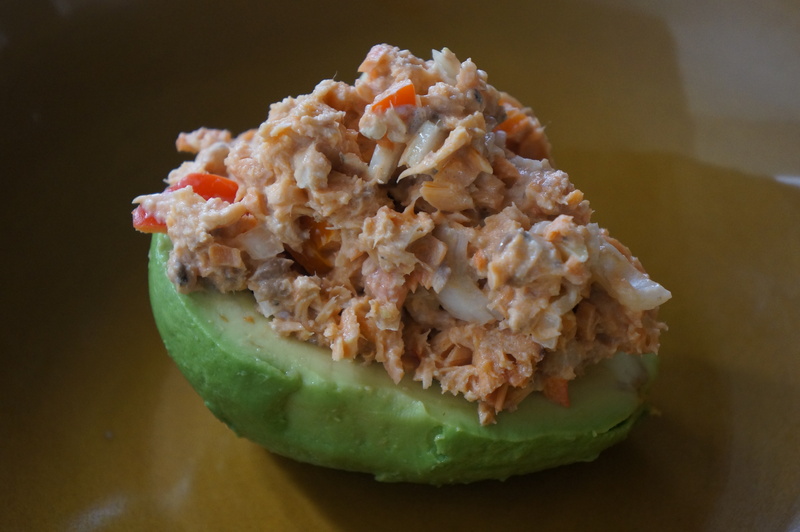 Can be served on 1/2 avocado for a grain-free meal. Could also be nice on crackers, as lettuce/cabbage wraps, or toast. 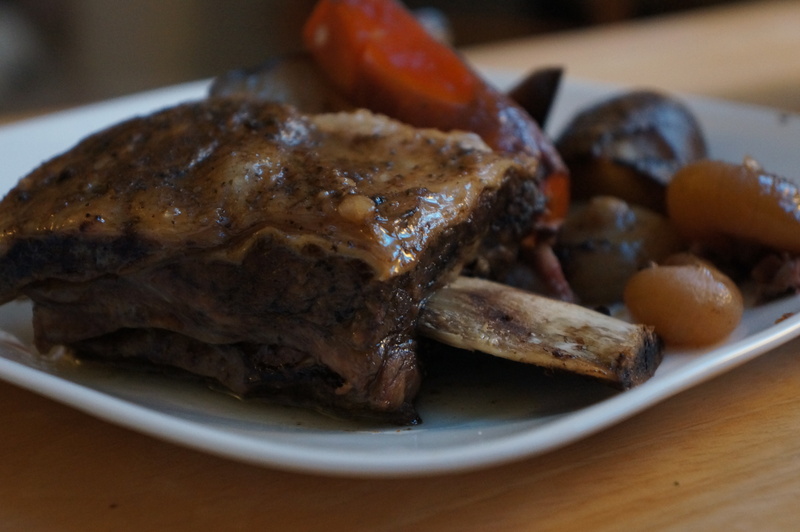 I found 2 packages of these beef short ribs in my mixed box from Dominion Valley Farm in the freezer. I’ve never seen those in there before. I’ve never cooked ribs before. What to do with them? I decided to thaw them in water for a few hours, dry with paper towels, sprinkle with worcestershire sauce, salt/pepper and rub with Penzey’s Roast Beef Seasoning. Then I placed them in the crockpot with carrots, potatoes, and cippolini onions on high for 6 hours. Wow. Melt-in-your-mouth beefy goodness! Biggest surprise? Cippolini onions! Another revelation – I’ll be making these as a vegetable all by themselves – they were so sweet and yummy! Did you know that you can learn to eat new things if you want? It’s a matter of practice and maybe a new and easy recipe. I have bought cans of sardines in the past, opened them up, and lost courage. Then they went to the dogs. But I know that sardines are super healthy, full of good fish oils and with little or no mercury being that they are such small fish. In addition, they are exactly where we want to be eating on the food chain for the health of the oceans. But I just couldn’t do it until I discovered a super simple recipe by K.C.’s Kafe. 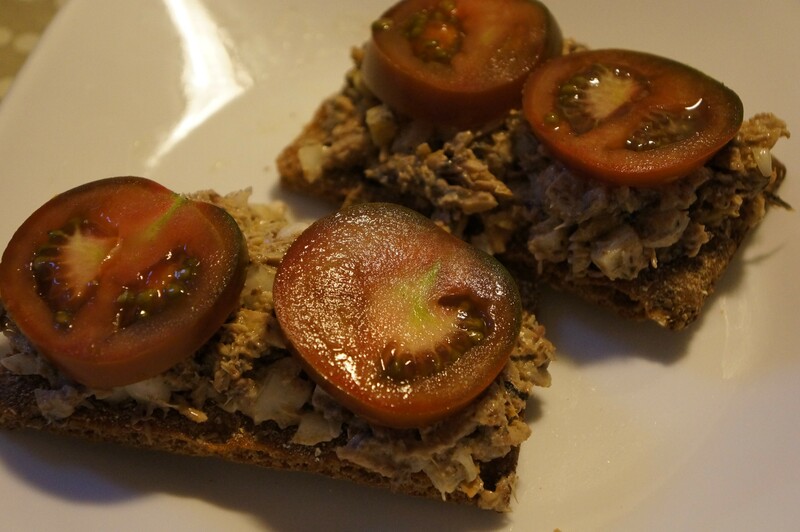 It’s just mashed sardines, finely chopped onion, and a little mayo. 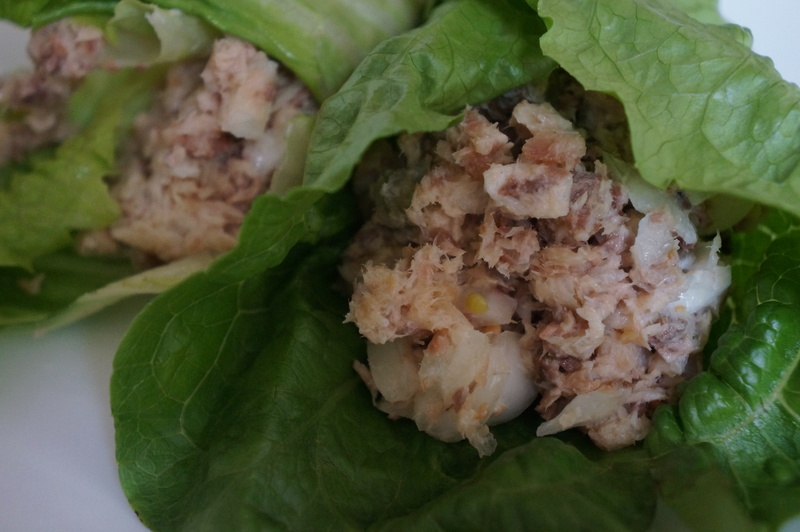 I put mine in lettuce or cabbage leaf wraps to save calories and keep grains to a minimum. Bill likes his on whole rye crackers. I love this! Now I’m wondering about the sardines in tomato or mustard sauces. That doesn’t sound good, but I may try them. I’ve already tinkered with this recipe, adding chopped dilly beans and diced red peppers. It’s such an easy recipe! I hope you’ve been eating a variety of citrus all winter long because this is the season they shine like the sun! If not, go get some right now. You can use the fresh burst of flavor and dose of vitamins. But try to break out of the orange mold. There are fabulous grapefruits, tangerines, mandarins, meyer lemons, and blood oranges too. What’s a blood orange you say? 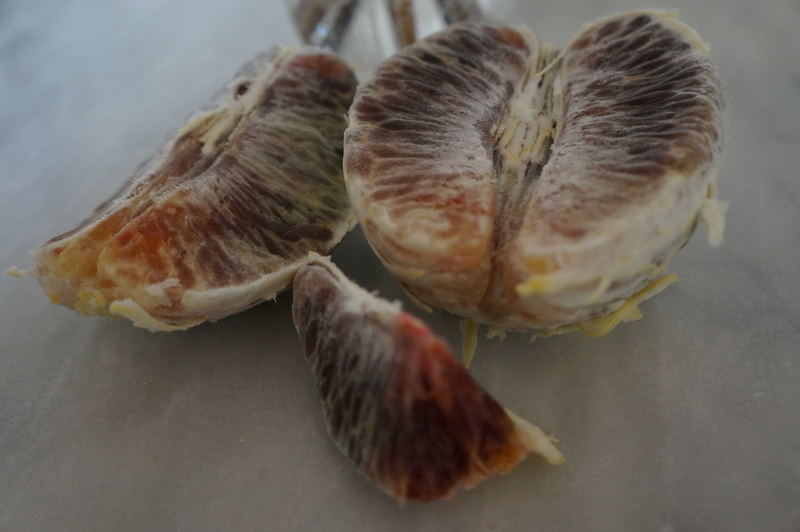 It often will have a red blush on the peel, but also may look just like an ordinary orange until you open it up and see the red-purple flesh. It’s a shock the first time. The flavor is too, as it has a distinct berry tinge to the orange taste. Yes, they are pricey, but you deserve a treat. You have almost made it through this horrible winter. What better to spend your pennies on?! I promised to explain what to do with the kale seedlings after they started to grow their second set of leaves (true leaves). This takes a few weeks to get to after they come up initially. You need a knife, some individual pots with soil in them, and water. I also like to have everything on trays that are easy to clean the soil from, but some people use newspaper and then put it all in the compost afterward. Gently use the knife to go under and around the plants and lift them out. Then you might have to disentangle them a bit to get individuals. You must not break the main stem. If you do, discard that one and get a different one to plant in the individual pots. 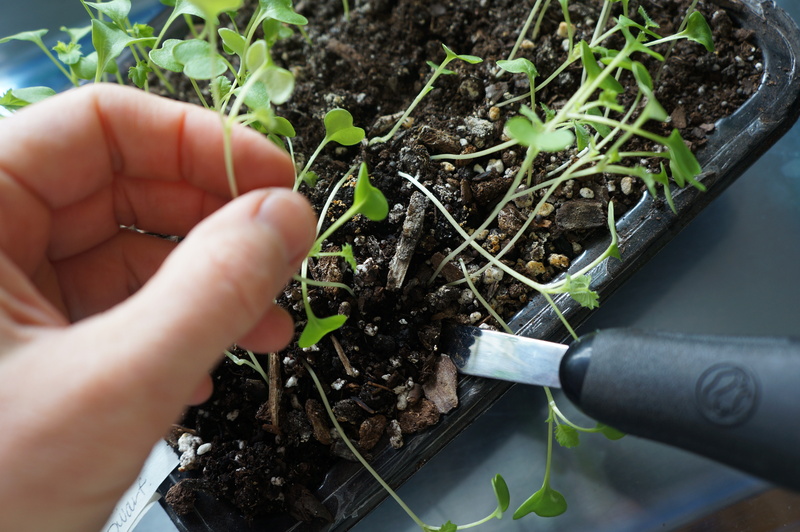 Stick your finger or a dowel in to the soil to make a spot for the little plant. 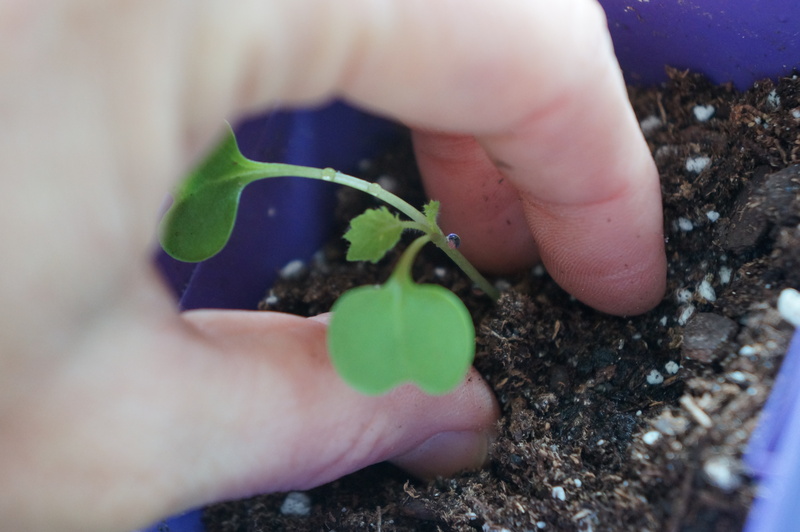 Then drop the roots in deeply and gently firm up the soil around the plant with your fingers. Water. If after watering the soil has settled too much or has left holes, add some more loose soil on top. Make a whole tray of them and put the tray in a bright window. Once they get their own pots they really start to take off. It’s fun to watch them strengthen and grow. They will be tender little guys from growing so safely indoors, so you cannot put them directly outside. The process of hardening off must happen first. For at least a week before you plant them outdoors you will keep them in their pots in a shady spot outside during the day and then protected at night like in the garage or on the porch. After a week or so they are ready for real outside conditions. 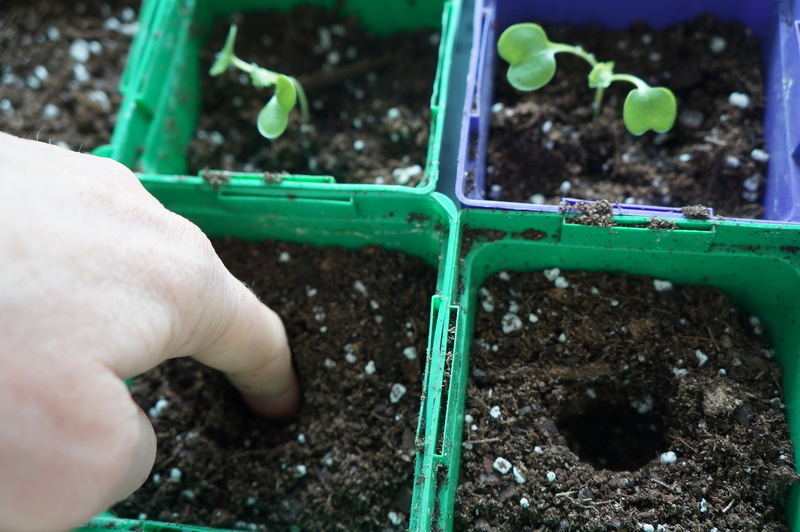 By May 31st, Wisconsin’s safe to plant outside date, you’ll have strong plants with a pot full of roots ready to go into the ground and start making you food! Favorite things to do with kale? 1. Wash, dry, slice super thin all the way through the tough center rib. Slice super thin the other way to make tiny pieces. Drizzle olive oil and seasoned rice vinegar and toss/press down into bowl. Let marinate for 20 minutes minimum, then add other salad veggies and enjoy! 2. Wash, chop coarsely and throw into whatever soup you are making. 3. Wash and throw into blender with fruit smoothie ingredients – you won’t even know it’s in there! 4. Enjoy the freedom from cancer, heart disease, and diabetes! Truly! 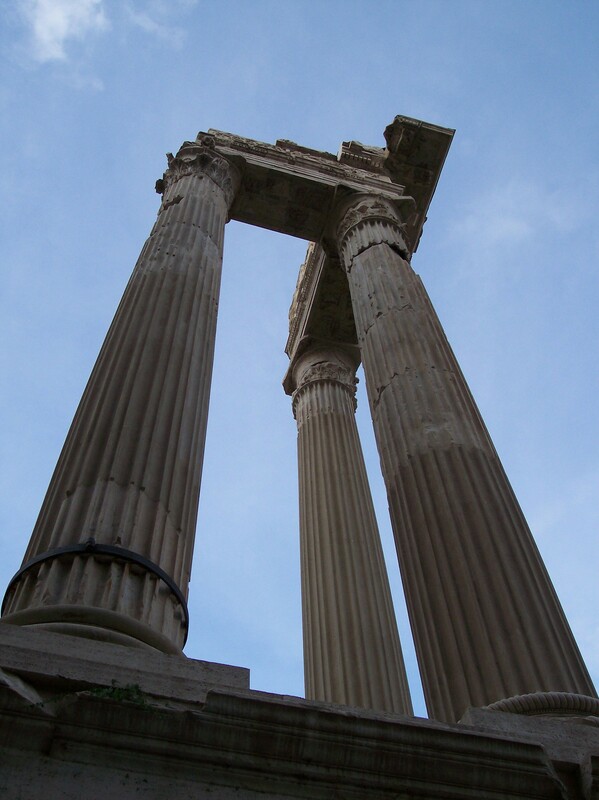 This morning with a temperature of 10º F outside and steel gray skies above I trip through my pictures of Rome. I remember walking through the streets and marveling at how it was hard to tell we were outside. The air was so still and warm. It was November! 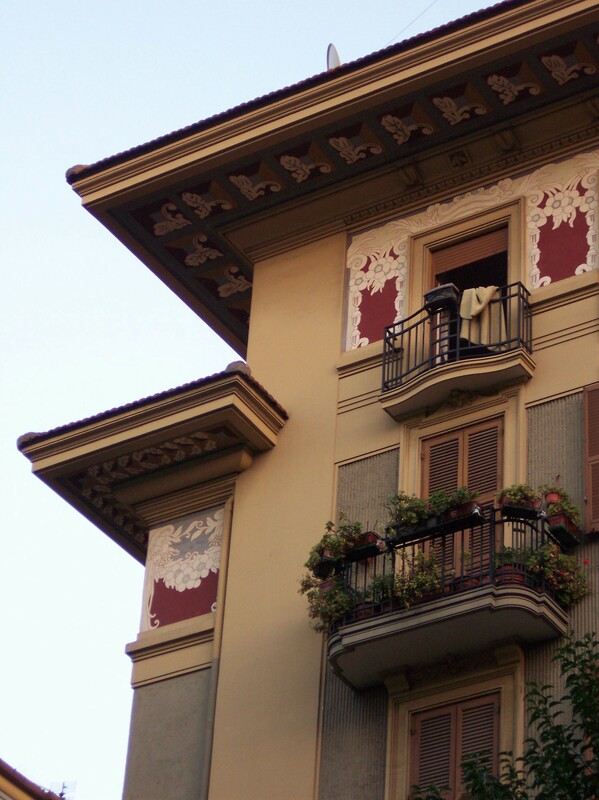 It was about 65º F most days and the Italians were walking around all decked out in heavy winter wear. Yes, boots, parkas, hats, scarves, gloves! 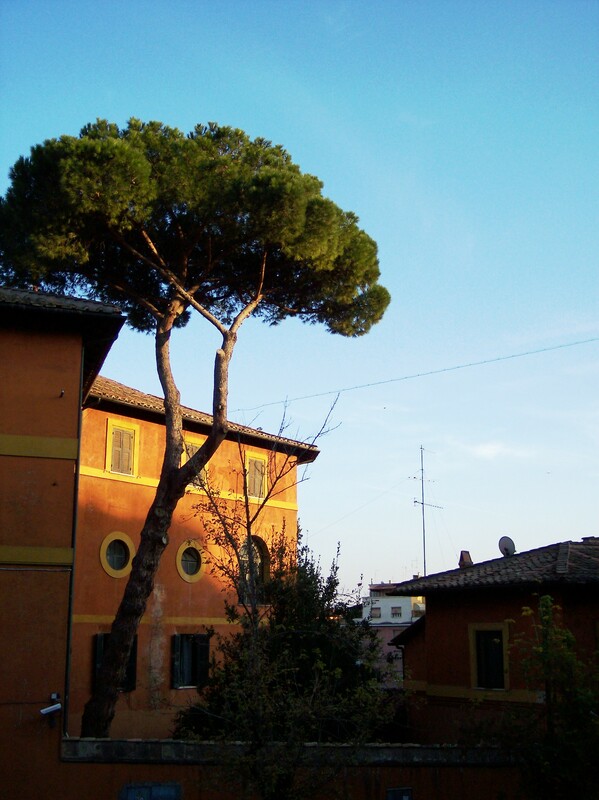 I could use a little Rome right about now.